20 // DECEMBER 2018 USAHOCKEYMAGAZINE.COM T ucked off of 49th Street in the Hell's Kitchen section of New York City sits a subterranean playground next to the New York School of Printing. From a nearby apartment window Joe and Brian Mullen could look down into the schoolyard and see fellow neighborhood kids organizing another spirited game of roller hockey. It was these marathon games that instilled a lifelong passion for the game that launched the hockey dreams of two unlikely American icons of the game. "Anytime I would see anybody over there I would put on my skates and run down five flights of stairs and go across the street and play," Brian Mullen recalled. "There was no coaching. We would just choose up sides and play." 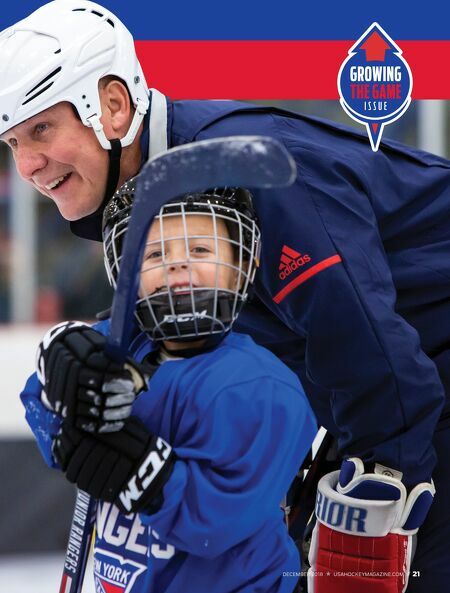 That passion has never left the 56-year- old former NHLer, who is now making it his mission to help his fellow New Yorkers, along with those from neighboring New Jersey and Connecticut, discover the same love that he has for the game. Twenty-five years after playing his final g a m e , M u l l e n s t i l l p r o u d l y s p o r t s t h e B r o a d way b l u e i n h i s r o l e a s a n a l u m n i ambassador for the Rangers, working with the organization's Learn to Play program. It's part of the NHL's initiative to open up to new generations of fans by putting sticks in their hands and skates on their tiny feet. 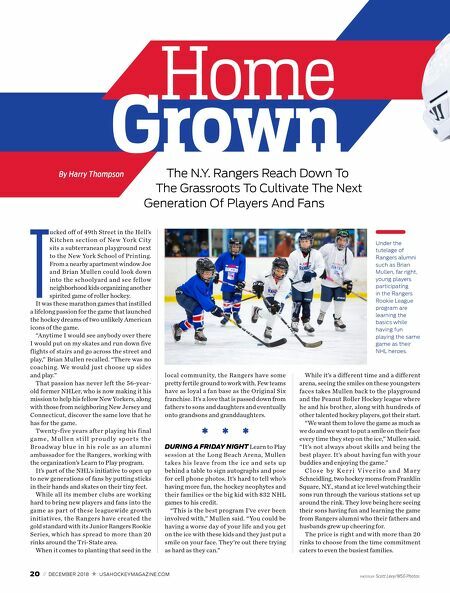 While all its member clubs are working hard to bring new players and fans into the game as part of these leaguewide growth initiatives, the Rangers have created the gold standard with its Junior Rangers Rookie Series, which has spread to more than 20 rinks around the Tri-State area. When it comes to planting that seed in the local community, the Rangers have some pretty fertile ground to work with. Few teams have as loyal a fan base as the Original Six franchise. It's a love that is passed down from fathers to sons and daughters and eventually onto grandsons and granddaughters. * * * DURING A FRIDAY NIGHT Learn to Play session at the Long Beach Arena, Mullen t a ke s h i s l e ave f r o m t h e i c e a n d s et s u p behind a table to sign autographs and pose for cell phone photos. It's hard to tell who's having more fun, the hockey neophytes and their families or the big kid with 832 NHL games to his credit. "This is the best program I've ever been involved with," Mullen said. "You could be having a worse day of your life and you get on the ice with these kids and they just put a smile on your face. They're out there trying as hard as they can." While it's a different time and a different arena, seeing the smiles on these youngsters faces takes Mullen back to the playground and the Peanut Roller Hockey league where he and his brother, along with hundreds of other talented hockey players, got their start. "We want them to love the game as much as we do and we want to put a smile on their face every time they step on the ice," Mullen said. "It's not always about skills and being the best player. It's about having fun with your buddies and enjoying the game." C l o s e b y K e r r i V i v e r i t o a n d M a r y Schneidling, two hockey moms from Franklin Square, N.Y., stand at ice level watching their sons run through the various stations set up around the rink. They love being here seeing their sons having fun and learning the game from Rangers alumni who their fathers and husbands grew up cheering for. The price is right and with more than 20 rinks to choose from the time commitment caters to even the busiest families. The N.Y. Rangers Reach Down To The Grassroots To Cultivate The Next Generation Of Players And Fans PHOTOS BY Scott Levy/MSG Photos Home Grown By Harry Thompson Under the tutelage of Rangers alumni such as Brian Mullen, far right, young players participating in the Rangers Rookie League program are learning the basics while having fun playing the same game as their NHL heroes.